user-generated Headlines and reports on this page = 4 news items. Page - 9. SPEEDY Asset Services Ltd wins Most Considerate Supplier Runner Up at Considerate Constructors Scheme 2017 National Awards. The Considerate Constructors Scheme; the national scheme established by the construction industry to improve its image; has recognised the highest performing Companies and Suppliers at this year's National Awards. 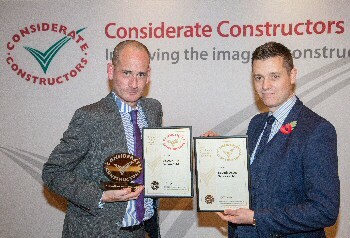 The Considerate Constructors Scheme's National Awards are 1 of the most respected accolades in UK construction. By registering with the Scheme, companies and suppliers demonstrate a strong commitment to improving the image of the industry. Speedy Asset Services Ltd, whose Head Office is based in Merseyside, was awarded Most Considerate Supplier Runner Up, at both of the prestigious awards ceremonies, on 2 November and 3 November 2017, held at the Four Seasons Hotel London, at Park Lane, London. All registered eligible suppliers and companies had their considerate performance assessed against the Scheme's Code of Considerate Practice, from 1 August 2016 to 31 July 2017, as part of the awards process. The awards recognise the highest performing suppliers and companies who have demonstrated excellence in relation to the community, the environment and their workforce. Speedy Asset Services Ltd is a principal facilities and asset provider to the construction industry, offering plant and equipment hire and maintenance, as well as professional training and a range of support services. Registered with the Scheme for just 16 months, this company is already making a huge impact as a considerate company, achieving all round excellent scores after acting upon the Scheme's Code of Considerate Practice, as well as Monitor advice and feedback. In total, 22 Gold, 37 Silver and 55 Bronze awards were presented to Registered Companies, while 3 Gold, 5 Silver and 1 Bronze were awarded to registered suppliers. Of the Gold Award winners, 10 shortlisted companies received the:- 'Most Considerate Company Runner Up' award and 2 suppliers received:- 'Most Considerate Supplier Runner Up' awards. Considerate Constructors Scheme Executive Chairman Isabel Martinson said:- "Each year the Scheme is amazed by the increasingly innovative and ingenious ways that companies and suppliers devise to elevate their levels of consideration to the community, workforce and environment. On behalf of the Scheme, I would like to offer huge congratulations to all of this year's award winners who have worked extremely hard to raise standards of consideration, both within their own organisations and for the good of the entire industry. We look forward to continuing to work with the industry to raise standards in considerate construction to an even higher level." WIRRAL Council is set to take action against rogue landlords through extending a licensing scheme which forces them to improve their properties; or face seeing them being taken off the market. Selective Licensing, which requires landlords to agree to a range of conditions around the standards of their accommodation, is being extended through some of Wirral's more deprived communities, after helping to drive up the quality of rented accommodation in parts of Birkenhead. The proposal on the table, which the Council's Cabinet will be asked to send through to public consultation at its next meeting, on 27 November 2017, is to extend the scheme to cover 4 more parts of East Wirral, areas where there is a higher than average number of private rented housing available and a high turnover of tenants. The 4 new areas proposed are:- Hamilton Square, Seacombe St Pauls, Birkenhead West and Birkenhead Central. These would join Egerton North, Birkenhead South, Seacombe Library and Egremont Promenade South as Selective Licensing areas. Cllr George Davies, Wirral Council Cabinet member for Housing and Community Safety, said:- "Wirral residents demand; and deserve; to live in good quality, safe and attractive housing. The availability of private rented accommodation has more than doubled in Wirral in the last 10 years and while we know that many of these properties are of an excellent standard, managed by responsible landlords, there are others that aren't up to scratch. We will not tolerate Wirral residents being forced to live in poor conditions by irresponsible landlords. This licensing scheme is a good way for us to tackle this issue and, where a landlord does not live up to their responsibilities to their tenants, we will not hesitate to take action against them. Our Selective Licensing scheme supports improvement in the quality of housing in the areas of Birkenhead and Wallasey where it is applied. It has brought many social and health benefits along with it and people from across the political spectrum have rightly highlighted its success and championed it for their own area, calling for its expansion. This is where the Council needs to step in and use all the powers that we have to drive up the standards of this housing on behalf of tenants and this is what we are aiming to do by extending the Selective Licensing scheme." A number of landlords living in the 4 existing areas, who have either failed to obtain licenses for their properties or fallen foul of the conditions they agreed to, have already been prosecuted by the Council, which demonstrates the commitment the local authority has to the scheme and its objectives. If Cabinet approves the business case and consultation plan, the next step is for the Council to begin a 10 week consultation process to gather the views of tenants, landlords and residents before making a final decision. 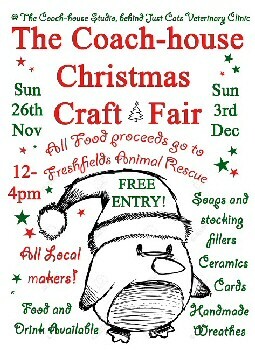 IN the community spirit for which Southport is renowned, Just Cats Veterinary Clinic on Duke Street, Southport, are holding a Christmas Craft Fair to raise funds for Freshfields Animal Rescue. Debbie Hughes, PR Co-ordinator for Freshfields Animal Rescue, said:- "We are delighted that our friends at Just Cats are supporting the animals in this way. The clinic has been part of our extended Freshfields family for many years, and we're very much looking forward to what we hope will be a successful day. The animals and staff at Freshfields would not be able to carry out our work without the participation of our generous local community. We're looking forward to meeting you on the day." The fair takes place in the Coach House Studio, just behind Just Cats, at:- 59 Duke Street, Southport, PR8 5BT, on Sunday, 26 November 2017 and Sunday, 3 December 2017, from 12pm to 4pm. AN award winning up cycling project is expanding in Wirral after the success of a pilot scheme. 'Refresh' re-uses unwanted materials and furniture from Magenta Living's empty properties and 'Bulky Environmental Refuse Team' (BERT) service to prevent items going to landfill, minimise waste and reduce fly tipping. To kick start the project, a show flat has been fully furnished using up cycled furniture to show what can be achieved with items that would otherwise have been wasted. A well attended engagement workshop took place using an empty Magenta Living flat in Seacombe. Volunteers were involved in creating:- mood boards, painting, joinery and decorating unwanted furniture items used to furnish the flat and bring it back to life, whilst learning new skills in the process. The project is delivered in partnership by Magenta Living, Wirral Council and Wirral Environmental Network (WEN) and aims to encourage Magenta Living tenants and the wider community to volunteer and up cycle furniture by providing residents with renovated and refreshed furniture for use in their homes. Magenta Living has also used the service to furnish some of their properties to provide much needed support for new tenants. Due to the success of this project and the show flat, Magenta Living, Wirral Council and WEN will be opening a new Refresh shop on Hoole Road, Woodchurch. This will be used for training in up cycling with a space available to display the up cycled furniture, ready for people from the community to use in their home. The Mayor of Wirral, Cllr Ann McLachlan who officially opened the show flat said:- "I was delighted and surprised to see the fantastic job which had been made of the furniture, which fully kitted out the flat. It looked fantastic; the volunteers were so proud of their work and I have to say they were all very skilled, with lots of flair and imagination; whether painting, recovering or putting the whole scheme together. Anybody would be proud to live in that flat with such great decor and furniture. This is a great example of how different organisations working together, in this case Magenta Living, WEN and the Council, can produce such positive outcomes." John Mycock, Assistant Director of Housing Services at Magenta Living said:- "Magenta Living residents have been involved in the Refresh project from the start and it's great to see what they have achieved. By volunteering and learning new skills this has encouraged them to improve their personal well-being and discover talents that they probably didn't realise they had." The Refresh project won a Level 4 'Thriving' award at the Royal Horticultural Society, North West In Bloom:- 'It's Your Neighbourhood Awards 2017' for the fabulous floral displays the volunteers made out of various unwanted materials. For further information about the Refresh project, contact:- Maureen Davies, Magenta Living's Environmental Services Manager, on:- 0808 100 9596.